-over 2,000,000 thefts from vehicles in the UK every year! -valuables left in a car are "Always" at risk! With so many Police warnings about the perils of leaving valuables in cars, everyone knows the risk. The trouble is, in the real world, who has the time to take all their valuables out and cart the stuff around with them every time they get out of their car? No one - because it`s not exactly convenient! How do you stop someone stealing your Sat Nav, Blackberry or other funky bits of kit or valuables? The solution is surprisingly simple - get yourself one of these brilliant little car safes. They live under your car seat or in the boot of your car most of the time, tethered with a security cable to a seat runner, seat belt anchor point or other suitable bracket ...so no one can remove the safe from your car without unlocking it! There`s a choice of units to suit different storage needs and budgets, but they are all easily affordable and all will cost you a lot less than replacing your stolen valuables! The double skin steel security compartment slides into the rugged outer sleeve and locks into position with the tethered security cable securing the unit safely in your vehicle. The self locking mechanism means that you`ll only need to use your key when you want to open the safe to get your valuables out again. Ideal for protecting smaller items like your; Sat Nav. or Blackberry your digital camera parking change, etc. -Non slip base to stop it slide about on a carpeted surface. In use, simply drop your valuables into the security compartment and slide it home into the rugged security sleeve. Push the security cable into the cable slot to lock the unit shut - Job Done! The lightweight, seamless moulded aluminium shell of this executive briefcase is both robust and attractive and the generous internal dimensions makes it suitable for Laptops up to 17". -Weighs just 2.75kg (incl: security cable & carry strap). 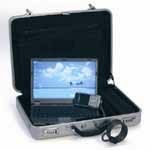 Portable security solution for your Laptop, documents and other items of value, wherever you are. The briefcase is simply secured to any convenient anchor point via the security cable provided. Lock it in the boot of your car, in your boat or caravan, in your hotel room, etc. The resettable combination lock protects the contents against unauthorised access. The key operated RPT lock locks the briefcase to the security cable (the auto lock mechanism means you`ll only need the key to release the briefcase from the security cable). Don`t miss out - grab yourself a bargain right now!